British auction house Antony Cribb Ltd celebrates their tenth, and largest sale yet. 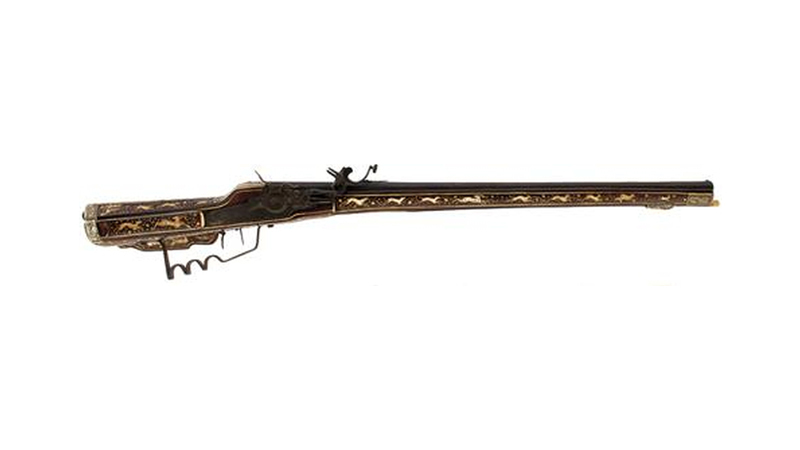 Their upcoming “Arms & Armour auction” features several historically impressive lots such as sporting rifles and duelling pistols from the 17th and 18th centuries. If you are into militaria, Antony Cribb Ltd is the auction to watch. With an impeccable focus on the history of warfare, and new spacious quarters in Newbury, Antony Cribb Ltd is one of the top British houses specialising in arms and armour. German wheel-lock sporting rifle. Photo: Antony Cribb Ltd.
Amongst the lots, you will find a German wheel-lock sporting rifle, circa 1625. This rifle is made for hunting purposes, and specially created for gaming wild boar given its design. Lot number 122 has already made quite a stir, and is estimated at £2,000 - 3,000. Work by Harvey Walklate Mortimer. Photo: Antony Cribb Ltd. There would not be an arms and armour auction without items by the renowned maker, Harvey Walklate Mortimer. Antony Cribb offers a fine pair of silver mounted duelling pistols, bearing silver inlays focussed on stands of arms and trophies. They are hallmarked 1786 and have and estimate of £10,000 - 15,000. A pair of flintlock duelling pistols made by John Manton. Photo: Antony Cribb Ltd.
Another important gunsmith during the 18th century was John Manton. Manton created arms and weaponry alongside his brother Joseph before the brothers split in the early 19th century. Antony Cribb will auction off a special piece created by John Manton from 1799. This lot consists of a pair of flintlock duelling pistols bearing the serial number 3255. These are just some of the many highlights of the Antony Cribb sale. In addition to pistols and long guns you will also find over 100 swords, 50 of which date back from the Georgian period. Find all the lots on Barnebys here!